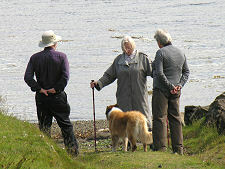 The Duirinish Peninsula stretches west from Dunvegan on Skye. 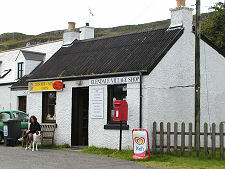 Most of the area is wild and uninhabited, with the flat-topped mountains of Healabhal Mor and Healabhal Bheag, or Macleod's Tables, dominating the surrounding countryside. The story goes that when the Chief of the Clan Macleod wanted to impress a visitor he dined with them atop Healabhal Mor, surrounded by torch-carrying clansmen. Man's impact on Duirinish today is mostly confined to a strip along its northern side. The single track B884 leaves the main road a mile south of Dunvegan and begins its entertaining journey west: though a short cut from the south end of Dunvegan cuts across the head of the loch by the campsite. 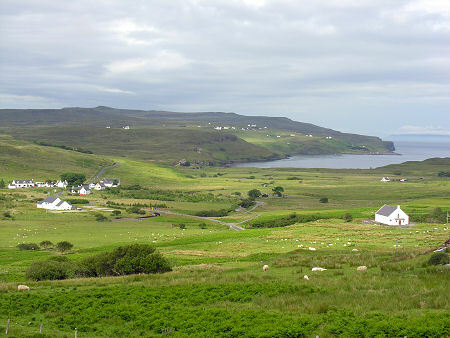 After some moorland wanderings, the road meets the west side of Loch Dunvegan and passes through the strung out crofting settlement of Colbost. 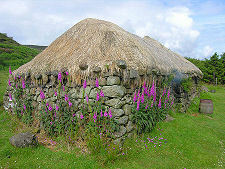 This is home to the Colbost Croft Museum showing how islanders lived in the 1800s. Period details extend to a replica of the illicit still that would have been a feature of many blackhouses of the time. 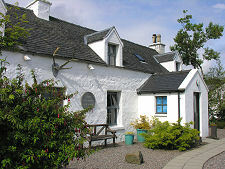 In recent years Colbost has become rather better known because of a neighbour of the Croft Museum, the Three Chimneys Restaurant and House Over-By. This Five Star Restaurant with Rooms was established as an act of faith in the mid 1980s by Shirley and Eddie Spear. 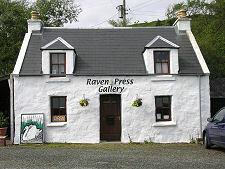 It has since become established as one of Scotland's, the UK's, and even the World's top restaurants. 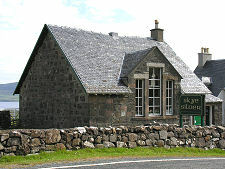 At the north end of Colbost is Skye Silver, home of "the original jewellery from Skye" in an old schoolhouse on a hillside overlooking Loch Dunvegan. North from here a minor road leads past the (now closed) Borreraig Park Museum to the crofting settlement of Borreraig. 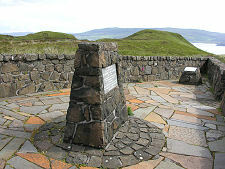 This area was the traditional home of the MacCrimmons, hereditary pipers to the Macleods, and the nearby site of their ancient piping school is marked by a cairn overlooking the sea. 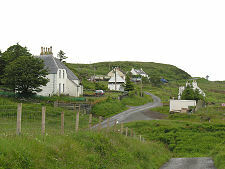 West from Colbost is the village of Glendale. This achieved fame in the early 1900s when, following a Royal Commission, the crofters became freeholders of the land on which they lived and worked. This followed decades of campaigning by the Glendale Land Leaguers and their leader, John MacPherson: who became known as the Glendale Martyr after a period of imprisonment in 1882. Until its closure at the end of the 2012 season, Glendale was also home to the third of Duirinish's trio of museums, the Glendale Toy Museum. Following the road west from Glendale brings you to the split-level settlement of Milovaig clinging to the steep slopes above Loch Poolteil. 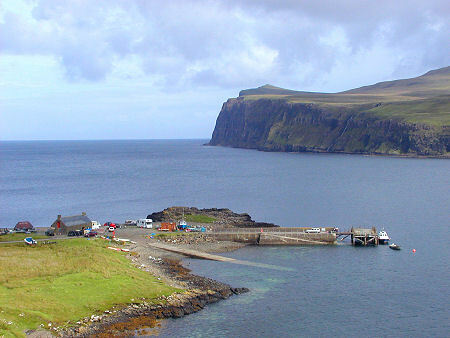 Below it is the attractive working harbour at Meanish. 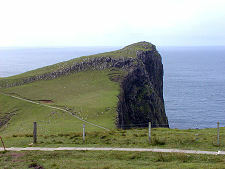 A minor road through Waterstein leads to Skye's westernmost point, Neist Head, complete with its lighthouse. South east of here is Waterstein Head guarded by sea cliffs nearly 1,000ft in height and towering above Moonen Bay. These are impressive, but the tallest cliffs in the area are a few miles north towards Dunvegan Head. The rest of Duirinish, sweeping down from Neist Point to Idgrill Point is rough and largely uninhabited. It wasn't always so. 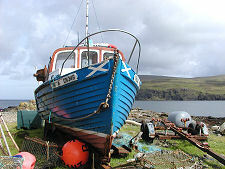 The inlet of Lorgill, halfway down the coast, and the glen behind it, were once home to a thriving crofting community. But on 4 August 1830 the crofters were ordered to leave their homes and board the ship Midlothian for forced emigration, on threat of jail if they refused. Those older than 70 were sent instead to the poorhouse.